Elizabeth Eckford and Hazel Bryan: What happened to the two girls in the most famous photo of the Civil Rights Era. In the most famous photo of the civil-rights era, she was the face of white bigotry. You’ll never believe what she did with the rest of her life. This is adapted from David Margolick’s book, Elizabeth and Hazel: Two Women of Little Rock. Who doesn’t know that face? It’s the face of a white girl—she was only 15 years old, but everyone always thinks her older than that, and judges her accordingly—shouting at an equally familiar, iconic figure: a sole black school girl dressed immaculately in white, her mournful and frightened eyes hidden behind sunglasses, clutching her books and walking stoically away from Little Rock Central High School on Sept. 4, 1957—the date when, in many ways, desegregation first hit the South where it hurt. It’s all in that white girl’s face, or so it has always appeared. In those raging eyes and clenched teeth is the hatred and contempt for an entire race, and the fury of a civilization fighting tenaciously to preserve its age-old, bigoted way of life. You know what the white girl’s saying, but you can’t print it all: commands to get out and go home —“home” being the place from which her forebears had been dragged in chains centuries earlier. That what that white girl was actually doing that day was more grabbing attention for herself than making any statement of deep conviction doesn’t really matter. Of anyone with that face, you simply assume the worst. You also assume she is beyond redemption, especially if, symbolically, she is more useful as is than further understood or evolved. So how is it that 55 years later, it is this same white girl—even more than the black girl—who feels aggrieved, who considers herself the victim of intolerance, who has retreated into embittered sadness? How can it be that she, who was so prominent at the joyous 40th anniversary of the events in Little Rock, celebrated by President Bill Clinton among many others, was invisible at the 50th, and ever since? The black girl is Elizabeth Eckford of the Little Rock Nine. Moments earlier, she’d tried to enter Central High School, only to be repeatedly rebuffed by soldiers from the Arkansas National Guard placed there by Gov. Orval Faubus. A mob baying at her heels, Elizabeth is making her way, fearfully but determinately, toward what she hoped would be the relative safety of the bus stop a block away. The face belongs to Hazel Bryan. Hazel, the daughter of a disabled war veteran, was largely apolitical, even on matters of race; while sharing the prejudices of her parents, she cared far more about dancing and dating. Being in that crowd that morning, making a ruckus, out-shouting all of her friends, was a way of getting noticed, and far more exciting than going into class. She’d thought nothing would come of what she’d done, and nothing ever would have had she not been captured in mid-epithet by Will Counts, a young photographer for the Arkansas Democrat. 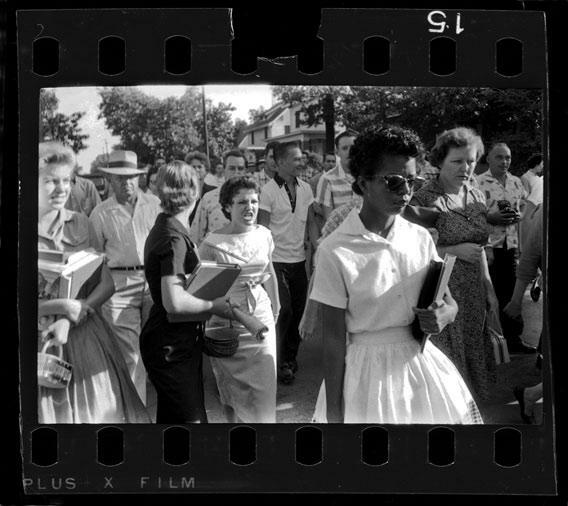 If anyone in the picture, which reverberated throughout the world that day and in history books ever since, should feel aggrieved, it’s of course Elizabeth Eckford. What Counts had captured both symbolized and anticipated the ordeals that Elizabeth, a girl of unusual sensitivity and intelligence, would face in her lifetime. First came the hellish year she and other black students endured inside Central, and then decades in which the trauma from that experience, plus prejudice, poverty, family tragedy, and her own demons kept her from realizing her extraordinary potential. With enormous courage and resiliency, Elizabeth ultimately made a life for herself and has largely come to peace with her past. Paradoxically, it’s been Hazel, who has led a life of far greater financial and familial security, who now feels wounded and angry. Someone who once embodied racial intolerance feels victimized by another form of prejudice, in which good deeds go unappreciated, forgiveness cannot possibly be won, and public statements of contrition breed only resentment and ridicule. Concerned over her sudden notoriety, only days after the infamous photograph appeared, Hazel’s parents transferred her from Central to a rural high school closer to home. She never spent a day in school with the Little Rock Nine and played no part in the horrors to which administrators, either lax or actually sympathetic to a small group of segregationist troublemakers, allowed them to be subjected. And she left her new school at 17, got married, and began a family. But Hazel Bryan Massery was curious, and reflective. Tuning in her primitive Philco with the rabbit ears her father had bought her, she heard the speeches of Dr. Martin Luther King Jr., and saw those black protesters getting hot coffee and ketchup poured on their heads at segregated lunch counters or being routed by fire hoses and German shepherds. Such scenes brought home to her the reality of racial hatred, and of her own small but conspicuous contribution to it. One day, she realized, her children would learn that that snarling girl in their history books was their mother. She realized she had an account to settle. Sometime in 1962 or 1963—no cameras recorded the scene, and she didn’t mark anything down—Hazel, sitting in the trailer in rural Little Rock in which she and her family now lived, picked up the Little Rock directory, and looked under “Eckford.” Then, without telling her husband or pastor or anyone else, she dialed the number. Between sobs, she told Elizabeth that she was that girl, and how sorry she was. Elizabeth was gracious. The conversation lasted a minute, if that. In the South, in the ’60s, how much more did a white girl and a black girl have to say to one another? Still, Hazel never stopped thinking about the picture and making amends for it. She severed what had been her ironclad ties to an intolerant church. She taught mothering skills to unmarried black women, and took underprivileged black teenagers on field trips. She frequented the black history section at the local Barnes & Noble, buying books by Cornel West and Shelby Steele and the companion volume to Eyes on the Prize. She’d argue with her mother on racial topics, defending relatives who’d intermarried. Secretly, Hazel always hoped some reporter would track her down and write about how she’d changed. But it didn’t happen on its own, and she did nothing to make it happen. Instead, again and again, there was the picture. Anniversary after anniversary, Martin Luther King Day after Martin Luther King Day, Black History Month after Black History Month, it just kept popping up. The world of race relations was changing, but to the world, she never did. 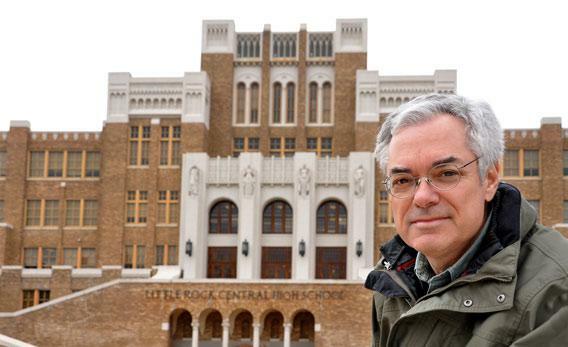 Author David Margolick in front of Little Rock Central High School. Finally, on the 40th anniversary of Central’s desegregation in 1997, Will Counts returned to Little Rock and arranged for Elizabeth and Hazel to pose for him again. Hazel was thrilled, Elizabeth, curious. Their first meeting was predictably awkward, but the new picture, showing the two women smiling in front of Central, revealed only the barest hint of that. It all but took over the next day’s Arkansas Democrat-Gazette, and very nearly upstaged President Clinton’s speech the next day, in which he worked in a reference to them both. Soon, a poster-sized version of the picture was available: “Reconciliation,” it said. Everyone rejoiced; Thanks to Elizabeth and Hazel, Little Rock, maligned for 40 years, bathed in instant absolution. Then, quietly, Elizabeth and Hazel discovered something quite miraculous: They actually liked each other. For all their differences—Elizabeth was better-read, Hazel’s life far better-balanced—they shared a good deal. Both were introspective, skeptical, a bit isolated; neither fit in anywhere, including in their own families. They visited one another’s homes, took trips together, spoke to schools and civic groups. In the process, Hazel helped pull Elizabeth out of her shell, then to blossom. Unemployed, on mental health disability for years, Elizabeth soon returned to work, as a probation officer for a local judge. Two years after they’d first met, the pair even appeared on Oprah. Winfrey hadn’t bothered hiding her incredulity, even disdain, that day: Of all people, these two were now friends? But as rude as both felt her to have been, she’d been on to something. The improbable relationship had already begun to unravel. A student of, and stickler for, history, Elizabeth looked for—and, she thought, spotted—holes in Hazel’s story. How, for instance, could Hazel have undertaken something so cruel so casually, then remembered so little about it afterward? And why, after all these years, did she absolve her parents from any blame? At their joint appearances, Elizabeth could treat Hazel impatiently, peremptorily. Meantime, others in the Little Rock Nine either shunned Hazel or complained of her presence at various commemorations. But resentment came as well from whites, particularly whites who’d attended Central, particularly those from better families, who’d thought that, even by always looking the other way, they’d done absolutely nothing wrong during those dark days and, truth be told, considered Hazel and her ilk “white trash.” Forty years earlier she’d given them all a black eye; now, she was back, more conspicuous, and embarrassing, than ever. At a reunion she foolishly, or naively, attended, she felt their cold shoulder, and could hear their snickers. None of them had ever apologized for anything they’d done or not done, and, as far as Hazel could tell, they’d been none the worse for their silence. Ultimately, it grew too much for Hazel. She cut off ties with Elizabeth—for her, Sept. 11, 2011, marked another anniversary: 10 years had passed since they’d last spoken—and stopped making public appearances with her. Her interviews with me—granted only with great reluctance—will, she says, be her last. When I asked the two women to pose together one last time (Elizabeth turned 70 last Tuesday; Hazel will in January) Elizabeth agreed; Hazel would not. Hazel was poised to vote for Obama in 2008; after all, even her own mother did. But so deep was her hurt that she found some excuse not to. So the famous photograph of 1957 takes on additional meaning: the continuing chasm between the races and the great difficulty, even among people of good will, to pull off real racial reconciliation. But shuttling back and forth between them, I could see that for all their harsh words—over the past decade, they’ve only dug in their heels—they still missed one another. Each, I noticed, teared up at references to the other. Perhaps, when no one is looking—or taking any pictures—they’ll yet come together again. And if they can, maybe, so too, can we.